The Ouzo Pro is considered the number one carbon fiber fork for the way it rides, handles and wins. The Ouzo Pro redefined how composite technology could improve cycling performance. Our proprietary, one-piece manufacturing process features 100 percent carbon throughout the crown for stiffness, responsiveness and strength. A fully integrated carbon steerer, crown and leg construction give the Ouzo Pro the rigidity necessary to absorb the toughest shocks. And our proprietary Vibration Minimizing System (VMS) significantly reduces road vibration. Nearly a decade after it was first introduced, the Ouzo Pro remains the industry standard. Reynolds Cycling is a division of MacLean Quality Composites. The two companies have successfully defied industry preconceptions about how materials can be implemented in high performance cycling applications. By leveraging the ingenuity and know-how of these combined engineering resources, Reynolds Cycling is able to design and manufacture carbon fiber and alloy components that transform the cycling experience at all levels. This unique capacity to shape materials technology is the essential ingredient in some of the most sought-after frames, forks, wheel sets, and components in the industry, including Trek, Specialized, Serotta, Seven Cycles, Independent Fabrication and, of course, Reynolds own brand of performance equipment. 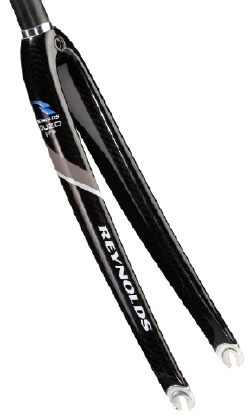 For more information about Reynolds Cycling please visit www.reynoldscycling.com. Reynolds, the Reynolds logo, Reynolds Cycling, MacLean Quality Composites, Ouzo, DV, MV, Attack, Topo, KOM, and Solitude are trademarks or registered trademarks of MacLean Quality Composites or its subsidiaries in the United States and/or other countries. All other company or product names are trademarks of their respective owners and, in some cases, are used by Reynolds under license. Specifications, pricing and delivery schedules are subject to change without notice.